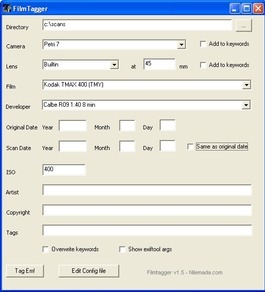 Filmtagger is an application for those of us that still like to shoot film but use the computer to manage our photo collection. Filmtagger makes it easy to embed EXIF, XMP or IPTC information in the scanned images about camera used, film, ISO, lens, date and other tags. The program will scan the selected catalog and set the appropriate tags in all jpg or tif images it can find (a backup file will be created). Nerd info: Written using Lazarus Free Pascal on WinXP. The EXIF stuff is all handled by exiftool by Phil Harvey so this is basically just a GUI for that tool. Note that this is software I wrote years ago. It will point to a domain I no longer have control of but other than that, the software works.